JUBA, South Sudan — The military overthrow of Sudan's longtime president quickly has raised concerns about whether the upheaval will destabilize neighboring South Sudan's fragile efforts at peace after five years of civil war. Amid the laughter and applause on the streets of South Sudan's capital, Juba, moments after the ouster on Thursday, there was worry about what will happen now that Omar al-Bashir , who helped broker a South Sudan peace deal last year, is gone. "It is too early to celebrate," Jacob Chol, senior political analyst and professor at the University of Juba, told The Associated Press. Al-Bashir's fall is likely to have a negative impact as he pushed South Sudan's warring parties to implement the peace agreement and he's no longer "on the throne," he said. Al-Bashir for decades had waged fighting with southern Sudan, which ultimately separated from the north in 2011 and became South Sudan, the world's youngest nation. Since the split al-Bashir's relationship slowly evolved into one of peacemaker, though with an eye on the oil-rich region that is now part of South Sudan. If Khartoum is no longer able to project its power onto Juba, it will be up to South Sudan's leaders to decide whether they want to move forward with the peace process and they may have to do it on their own, said Alan Boswell, senior analyst with the International Crisis Group. The peace deal signed in September has been fraught with delays and outbreaks of fighting. In a month's time, opposition leader Riek Machar is expected to return to South Sudan to once again serve as President Salva Kiir's deputy, an arrangement that has ended more than once in deadly fighting. But key parts of the peace deal have yet to be implemented including the defining of internal boundaries and creating a unified national army. In a report last month the International Crisis Group warned of a "high risk of collapse." On Thursday at a retreat at the Vatican, Pope Francis knelt and kissed the feet of South Sudan's rival leaders in an unprecedented act of humbleness to encourage them to strengthen the African country's faltering peace process. South Sudan's government denied that al-Bashir's removal will affect it. "The peace agreement is not based on a person. It was based on institutions," government spokesman Ateny Wek Ateny said. Whoever comes into power next in Sudan is an internal matter, he said. On the streets of Juba, crowds gathered to discuss al-Bashir's removal and Sudan's future. "There are children who have spent all their lives under al-Bashir. Congratulations to the youth in Sudan. They shouldn't have to live with a dictator," said Martin Wani, a businessman. Some South Sudanese sent messages of peace to their neighbors. "War anywhere in the world is hopeless. It's time both of the Sudans lived in peace," said Akon Kual, a car mechanic. Recent economic turmoil in Sudan sent some to live in South Sudan instead. 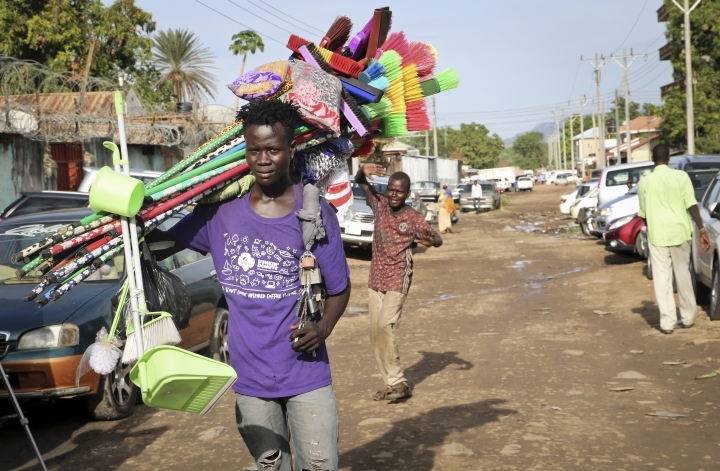 Ismail Alteib said he arrived in Juba four years ago because it was a better option than living in Khartoum. Now that al-Bashir is out of power Alteib is considering going home. "I knew the day would come when he'd have to go," the shopkeeper said of the longtime leader. After al-Bashir's ouster, Sudan's defense minister, Awad Mohammed Ibn Ouf, announced two years of military rule, enraging protesters who want democratic change and civilian leaders. Not everyone was distressed. Standing on the street in Juba, Sudanese native Zakaria Hassan said the people already had forced crucial change for years to come. "The youth have been awakened," Hassan said. "Anyone who goes into the office next will know that the youth are watching and will have to be very careful."